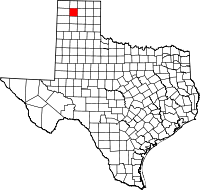 Moore County is a county located in the U.S. state of Texas. As of the 2010 census, its population was 21,904. The county seat is Dumas. The county was created in 1876 and organized in 1892. It is named for Edwin Ward Moore, the commander of the Texas Navy. The Dumas, TX Micropolitan Statistical Area includes all of Moore County. Moore County history is highlighted in the Window on the Plains Museum in Dumas. According to the U.S. Census Bureau, the county has a total area of 910 square miles (2,400 km2), of which 900 square miles (2,300 km2) are land and 9.9 square miles (26 km2) (1.1%) are covered by water. As of the census of 2000, there were 20,121 people, 6,774 households, and 5,331 families residing in the county. The population density was 22 people per square mile (9/km²). There were 7,478 housing units at an average density of 8 per square mile (3/km²). The racial makeup of the county was 63.93% White, 0.69% Black or African American, 0.67% Native American, 0.86% Asian, 0.03% Pacific Islander, 31.20% from other races, and 2.62% from two or more races. 47.50% of the population were Hispanic or Latino of any race. There were 6,774 households out of which 44.80% had children under the age of 18 living with them, 65.10% were married couples living together, 9.00% had a female householder with no husband present, and 21.30% were non-families. 18.20% of all households were made up of individuals and 8.30% had someone living alone who was 65 years of age or older. The average household size was 2.94 and the average family size was 3.36. In the county, the population was spread out with 33.60% under the age of 18, 9.20% from 18 to 24, 28.40% from 25 to 44, 18.30% from 45 to 64, and 10.60% who were 65 years of age or older. The median age was 30 years. For every 100 females there were 100.60 males. For every 100 females age 18 and over, there were 97.40 males. The median income for a household in the county was $34,852, and the median income for a family was $37,985. Males had a median income of $29,843 versus $19,383 for females. The per capita income for the county was $15,214. About 10.10% of families and 13.50% of the population were below the poverty line, including 18.10% of those under age 18 and 10.90% of those age 65 or over. Moore County is a strongly Republican county, having given Senator John McCain 78.76% of the vote, over only 20.65% for Barack Obama in 2008. It also gave George W Bush (R) 81.75% over 17.93% John Kerry (D) in 2004. Moore County is represented in the Texas House of Representatives by the Republican Walter Price, IV, elected on November 2, 2010. The district also includes the majority of neighboring Potter County — Amarillo. Moore county is represented in the US house of representatives by Mac Thornberry (R) as it is a part of Texas's 13th congressional district. ^ "Dave Leip's Atlas of U.S. Presidential Elections". Retrieved 2011-06-11.